“The Famous Corn” is the first thing that comes to my mind when I think of the Habana Outpost in Fort Greene, Brooklyn, New York. Neil Nice (Turntablelab) introduced me to the delicous side dish only made of corn, butter and powdered sugar, served with fresh lime during the seen. team´s stay in NYC early last year. Café Habana and the Habana Outpost eateries were built on the principles of great food, great fun, and social responsibility. Our mission is to show respect for the community, the environment, and the arts in a setting that is always fun and accessible. 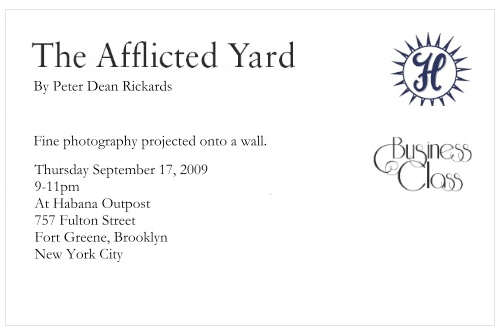 Tomorrow night, at the Outpost in Fort Greene, “the arts” means “the yard” – “The Afflicted Yard” to be exact: Business Class presents an outdoor exhibition by Peter Dean Rickards (via Peter and the NY Times Local Blogs). Peter will be projecting a selection of his photography onto our wall at Habana Outpost. Come and meet this legendary enfant terrible. … kids are always at this place so there won’t be any guns, naked girls, pigs being killed or gangsters standing up outside the good-good white people place crushing out weed.